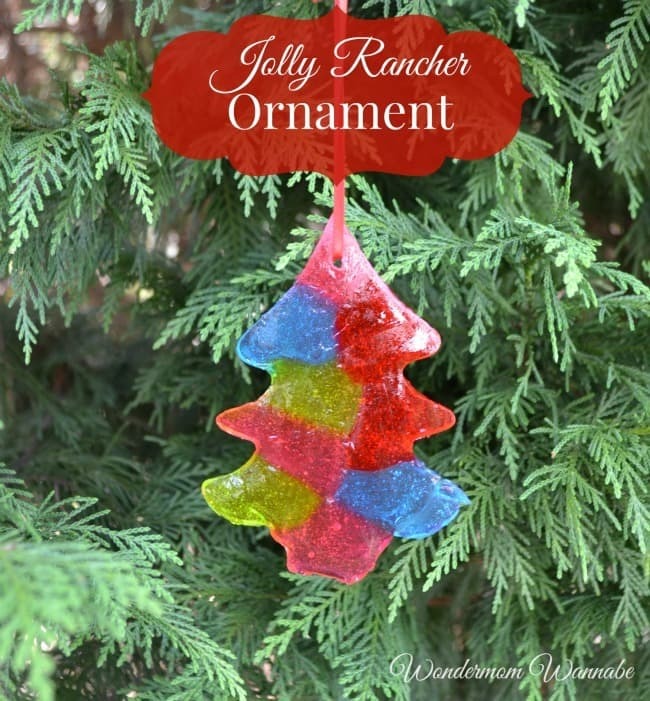 This Jolly Rancher ornament is a fun craft to make with the kids and a great way to use up these candies if you want to reduce the risk of cavities. It’s also the perfect way to get in the Christmas spirit. As I was foraging through my kids’ leftover Halloween candy for chocolate, I realized they had a lot of Jolly Ranchers floating around in their candy bags. Apparently, they either received a lot of these or they just didn’t like them as much as the other candy. Either way, since Halloween was more than two weeks ago, I decided it was time to start coming up with ways to use up all the leftover candy. So, I gathered up a bunch of the Jolly Ranchers and turned them into a Christmas ornament. Before I tell you how I made my Jolly Rancerh ornament, I have to warn you, even though I somehow managed to pull this off with my almost non-existent craft ability, this was NOT an easy project! I will share all of my mistakes and lessons learned so that if you want to recreate it, your process will be more streamlined, but even with tips and tricks you will need a little finesse and a pinch of patience to pull it off. Line a cookie sheet with parchment paper and coat a cookie cutter with butter, cooking spray or oil. Unwrap Jolly Rancher candies and place as many as you can fit in a single layer within the cookie cutter. Bake at 250° for about 5 minutes (candies will have softened and melted slightly but haven’t become completely liquid. Remove from oven and insert a juice box straw near the top to create a hole for the string. Leave straw in place until candy has cooled. Before candy cools completely and hardens (about 1-2 minutes after removing from oven), gently press on edges of ornament to release it from the cookie cutter. Use a butter knife to separate the candy from the cookie cutter if necessary. Push straw all the way through the hole and then tie a piece of ribbon or string through to form the ornament hanger. Don’t skip the parchment paper and greasing the cookie cutter! Jolly Ranchers cool and harden quickly and they adhere to whatever they touch. If you ignored the first important note, you can still salvage your cookie sheet and cookie cutter by returning them to the oven and heating until the candy melts again. Then, wipe off quickly before the candy cools. After you’ve baked the ornament, do NOT wait for it to cool completely to remove it from the cookie cutter or you risk the ornament cracking or breaking. Ideally, the candy will be semi-solid and malleable while you work to release it from the cookie sheet. I used my toaster oven. You can use a full-sized cookie sheet in a full-sized oven so you can make multiple ornaments at once, but make sure you have a small army to help you quickly make the hanger holes and to help you extract the ornaments from the cookie cutters before they cool. If you do break the ornament trying to free it from the cookie cutter, simply put the broken pieces back inside the cookie cutter and melt them again. I had to do this twice with the ornament pictured above. If this project hasn’t frightened you away from making your own ornaments, you might want to tackle these other projects from a couple of my friends. 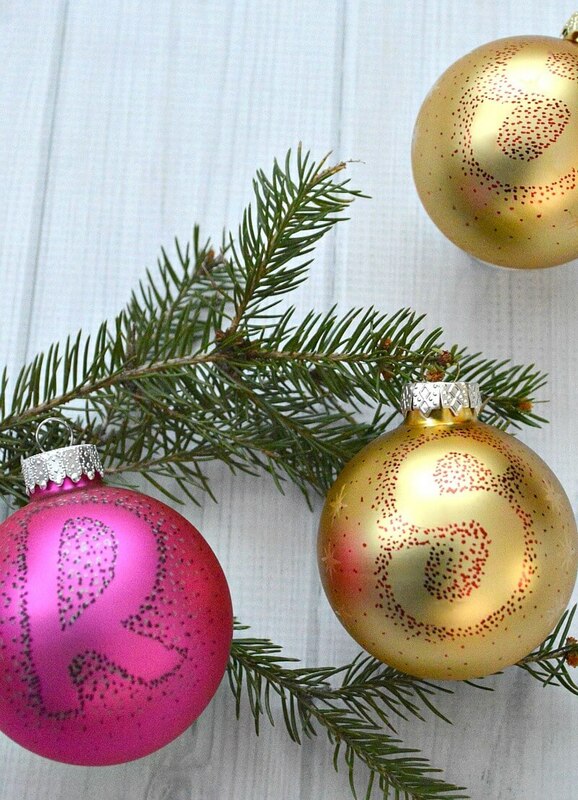 These monogrammed ornaments add a personal touch and are easy to make. You can find the instructions for these easy DIY ornaments at Organized 31. And how about an ornament that does double duty? This bird feeder ornament is both decorative and serves as a holiday treat for your feathered friends. 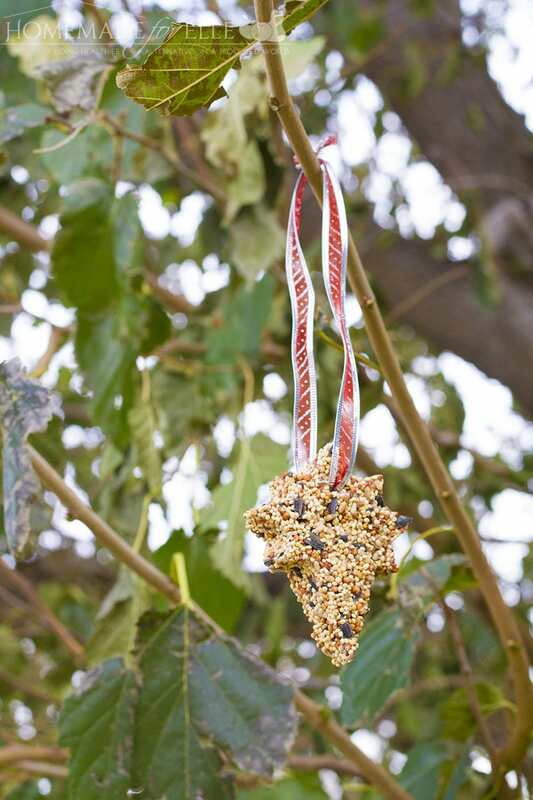 Find out how to make your own bird feed ornament at Homemade for Elle. 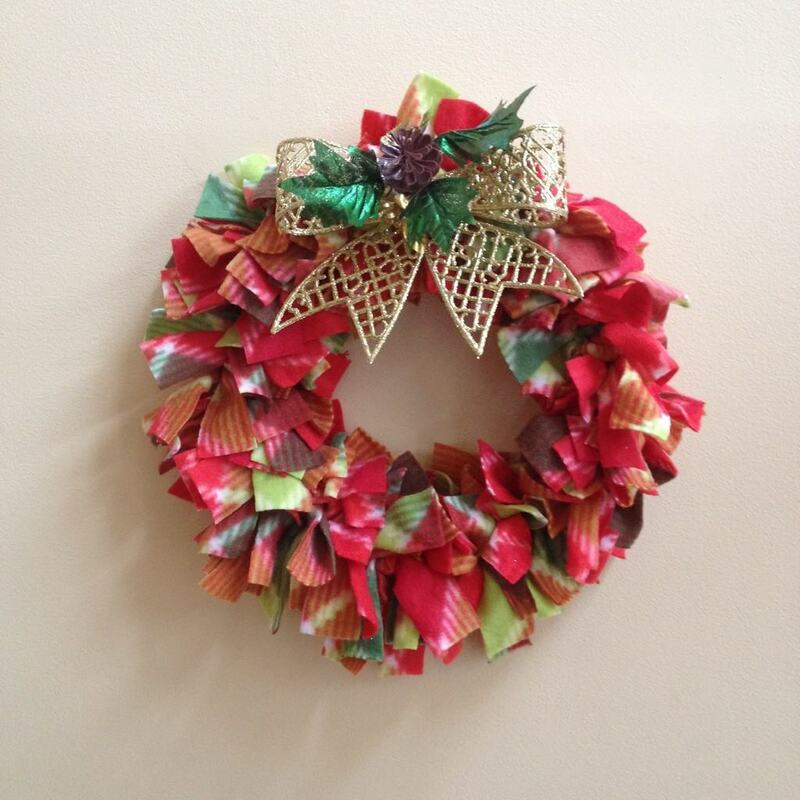 And if you’re really in the mood to craft, check out my post on a SUPER easy DIY fleece wreath. They are easy enough for kids (and me) to make! Better yet, it’s an inexpensive craft (under $5). Can you spray polyurethane on them to keep or are they one season only?? Libby, that is an excellent idea! I can’t see any reason why you couldn’t. This turned out great! I love that you shared your challenges so that I can be prepared for when I make these (I am also NOT great at crafts!). Thanks for the tips 🙂 Using the toaster oven is a great one. I love how colorful your ornament looks against the greenery of the tree.